German scientist; born at Breslau Oct. 9, 1818; died there Dec. 17, 1891. He received a thorough Hebrew and secular education at the institutions of his native city, and devoted himself at the university to the study of mathematics and astronomy. In 1845 he joined Graetz in agitating for an address to Zacharias Frankel to congratulate him on the conservative stand which he had taken against the Frankfort Conference; and when Frankel assumed the management of the Breslau seminary he appointed Zuckermann on the teaching staff. He gave instruction in mathematics to those of the students who had not had a regular school training, and taught calendric science in the academic department, at the same time acting as librarian and administrator of the stipendiary fund. He wrote: "Ueber Sabbathjahrcyclus und Jubelperiode," Breslau, 1859 (translated into English by A. Loewy, London, 1866); "Ueber Talmudische Münzen und Gewichte," Breslau, 1862; "Katalog der Seminarbibliothek," part i., ib. 1870 (2d ed., ib. 1876); "Das Mathematische im Talmud," ib. 1878; "Tabelle zur Berechnung des Eintrittes der Nacht," ib. 1892; "Anleitung und Tabellen zur Vergleichung Jüdischer und Christlicher Zeitangaben," ib. 1893. He also contributed occasionally to the "Monatsschrift für Geschichte und Wissenschaft des Judenthums." Zuckermann's religious attitude was strictly Orthodox. Regularly twice a day he attended the synagogue maintained by him in the house which he had inherited from his father, although he lived in the seminary building, where daily services were held in the chapel. He never married; and while genial and kindly in nature, he was strongly opposed to anything savoring of ostentation. On his seventieth birthday he fled from Breslau to escape all ovations, and in his will he forbade the delivering of a funeral address. 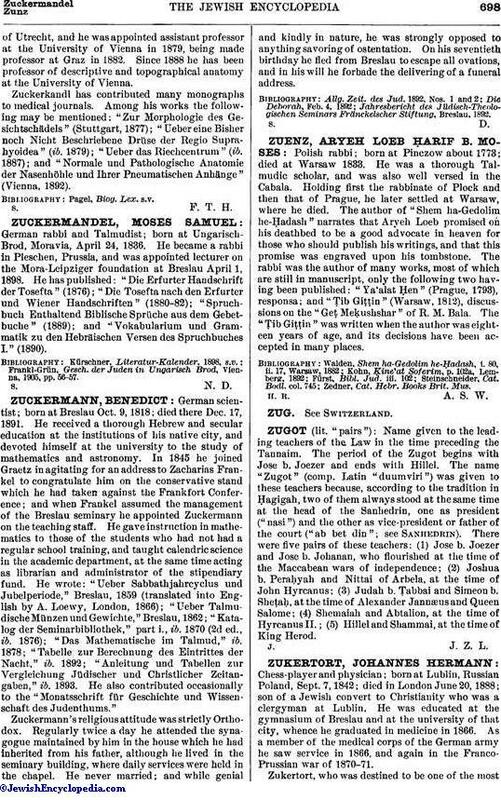 Jahresbericht des Jüdisch-Theologischen Seminars Fränckelscher Stiftung, Breslau, 1892.